Where are all those teeth? The students will explore the legend of the tooth fairy. Where do they think the fairies take all those teeth or is there just one fairy, etc. 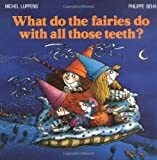 Book – What do Fairies Do With All Those Teeth? Discuss. Ask the children what they believe the tooth fairy does with all the teeth he/she collects. Is there more than one fairy? What does he/she look like? Read the book listed above. Ask the children which ones they believe the tooth fairy does use them for. Which ones not. Do they have any suggestions for them? What would they do with all those teeth? Tell the students they are going to make their own gleeming tooth necklace. Have the children take turns adding ingredients. Mix the items above. Give each child a ball of dough after you have kneaded all the lumps out. The children like to help with this also. Have them flatten out the ball. Take a finger and press in an idention into the bottom. Take a drinking straw and put a hole through the top of the tooth. Bake at 250 for an hour or until hard. When cooled, take a piece of yarn long enough to fit around child’s neck for a long necklace. Tie! You have a gleeming tooth necklace. You can omit the glitter but it does give it a shimmer.